Task management. This is a necessary evil that every person with anything to do must deal with in some form or other. Set aside the first 15 minutes of your day. Review anything that’s come up overnight. Adjust the list if needed. Review your list and decide what your priorities are for the day. This is a bit of a soap box for me. I don’t care how great your memory is. If you don’t write it down – even the little stuff – you will most likely forget something. 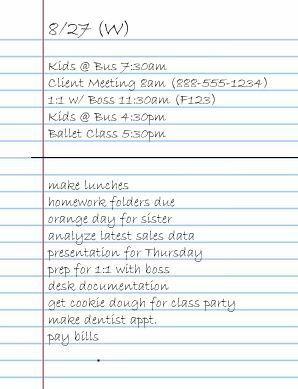 I don’t care if you have an app on your phone, use OneNote, or use an old-fashioned checklist. Just write it down somewhere. Don’t work from your entire task list on a given day. Keep one list for long-term tasks or tasks you know you won’t get to that day. Then, for today, work from a list of tasks that are just for today. Your To Do List won’t be so intimidating that way, and you’ll feel you accomplished more. Psychology is a big part of good task management. Understand when your time is heads down (you can’t/shouldn’t be interrupted) vs. when you can be interrupted without it causing a problem. When needed schedule that heads down time, go to a different room (or get out of the house), or put up signs that say please wait until x:00pm. Being clear with yourself and with others about heads down time is the key. Dare to tell someone your estimate of how long something will take. Example…. your boss says I need XYZ by noon. You can dare to say “To do it right, I need until 2pm.” Let them make the call if they still need it by the original deadline or they can wait. If they can’t wait, now they are clear that they’re getting the rushed version. Never be afraid to clarify. I can’t tell you how many times someone has said to me, “I need ABC.” I gave them what they asked for and it wasn’t what they really needed. Frequently, clarifying questions result in my saying, “You don’t need ABC, you need EFG.” This saves everyone time and frustration. Stop thinking, act! / Stop acting, think! There are times when you think a project to death and never actually do. As an author, I’ve had a LOT of friends tell me that they’ll write that book someday, but don’t get to it because they over think it. That’s when you need to stop thinking and act. Frequently getting started will get your creative/cognitive juices flowing. There are also times when you are moving too fast. This results in mistakes and having to go back and redo. If you catch yourself doing this, take a deep breath and deliberately slow down. Or even take a break and then come back. If your task is something you owe to another person or people, manage expectations. It’s better to over communicate in general. Tell them when you’re running late, but give an ETA. If you’re running up against that ETA, then let them know you need more time BEFORE that time passes. Tasks often pile up throughout the day. Any tasks that take you 2 minutes or less to complete, do them the second they come in. It gets those off your plate immediately. Also, most time management experts say that you are more efficient working on the shorter tasks first. Caveat: If you are someone who has trouble getting back into the groove of what you were doing, then save those 2-minute tasks. Work on them after you complete what you’re working on at the moment. Knock out the rest of your 2-minute tasks (if any are left). Check you didn’t miss anything major. Send ETA emails / set expectations as needed for the following day. Write out your task list for the next day. Need help on a regular basis? Hire one of our Virtual Personal Assistants (VPA) on an hourly basis. Whether it’s weekly needs or for a single project, we can help! PLUS: All of the à la carte duties listed on this website are available via our VPAs at their hourly rate!